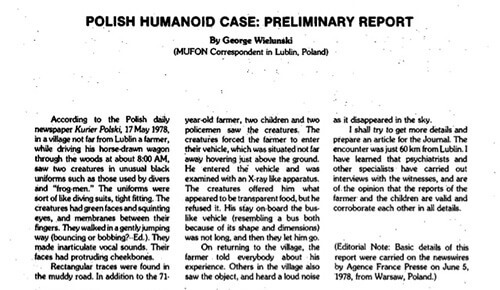 On the morning of the 10th of May, 1978, a 71 year old farmer named Jan Wolski from Emilcin was the subject of a very long and clear alien encounter. Of course, non-believers were quick to search for reasons why this abduction, like any other, lacks credibility, but could come up with no more than a handful of highly dubious ones. The extraterrestrial beings were also seen by a 6 year old boy. Just for yoga practice, let’s give the 6 year old to the skeptics and say a small child’s imagination can run free, although in 1978 there was no internet and they weren’t showing any occidental UFO movies in Poland at the time. The kid had no prior UFO knowledge, so at most, the skeptics can argue collective memory, but that would also work on UFOlogy’s favor, meaning his ancestors had also encountered extraterrestrials. Modern day encounters are hard to believe because of all the hype and technology that make it easy to hoax such an event. However, the complete absence of media exposure in the 70’s and 80’s, especially in a country like Poland, makes these people’s statements very credible. Now let’s focus on Jan Wolski and his depiction of what happened on that morning. He remembered leaving his house in a wagon at 5 in the morning. More than 2 hours into his trip in the countryside, up the road, he noticed what he first thought were two hunters headed in the same direction. He describes them pacing their steps so his wagon could catch up. When he did, the official report says: “It was at this point that Wolski was struck by the greenish tinge of their faces,"
The way in which they walked was like the way that divers walk on the seabed: they were performing ‘supple jumps’, recalls the old farmer. Dr. Zbigniew Blania Bolnar, a well-respected sociologist questioned Wolski and wrote a report, including personal conclusions. In his own words, the farmer described the aliens wearing something resembling one piece scuba diving gear: “People say that such outfits are worn by divers, but I never saw a diver so I cannot say." This is also a statement which gives strong credibility to this case. Jan Wolski was a religious man, raised a Roman Catholic, so he did not believe in extraterrestrial existence. His first guess was that the strange human like beings were probably of Asiatic descent, and his thoughts when asked about this were: “Nothing, what is there to think?! I see more freaks. So what?!" The two walked along his wagon for a short period of time, then peacefully seated themselves on each side until reaching their destination. 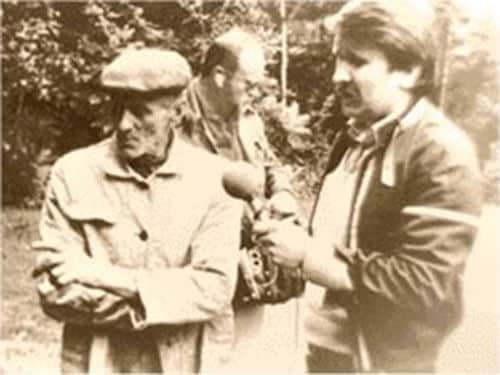 Wolski remembers not feeling endangered at any time, even though he couldn’t understand what they were saying: “They did not address me, they talked among themselves, but who could understand such a language?!" 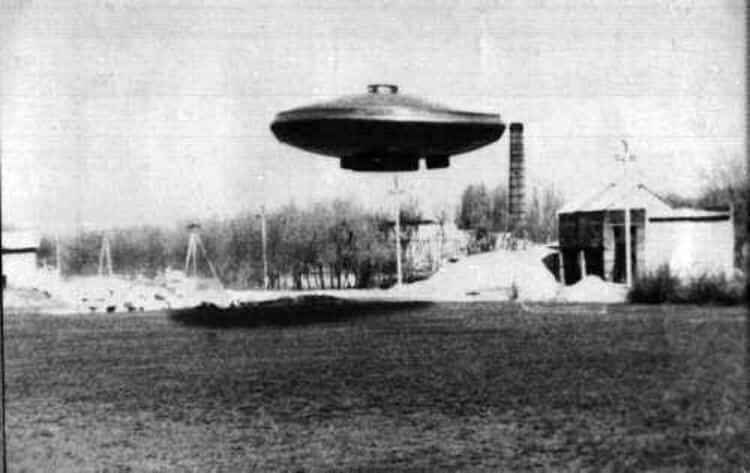 When they got to the actual alien craft, the farmer, with no prior UFO information whatsoever, saw a gigantic rectangular shaped bus (with a base made out of wood) simply “sitting” in the air. Let’s see the skeptics try to explain this one. Wolski told investigators how the human like beings were eating something that crumbled like bread which he refused when offered. I took off everything and just stood there. And the other one held in his hands something like two plates… he stood in front of me and put these plates together so that they clicked. Then, that one who came with me turned me on a side, raised my arms and the other clicked again." The basic, simple language used by the farmer when describing the incident makes it hard to deny. He also tells of crows on the UFO’s floor, that were not dead, but somehow inanimate or paralyzed. These small details simply wouldn’t add up if he was just seeking attention or trying to hoax the event. Today, this monument stands as a reminder that our world is not as it seems. In the official report, Dr. Bolnar concluded that: “There is no doubt that the witness is deeply convinced that all what he has experienced was an objective reality." The local priest, who would be practically obligated by the church to deny any extraterrestrial existence at the time, was of the same opinion. Q.E.D. 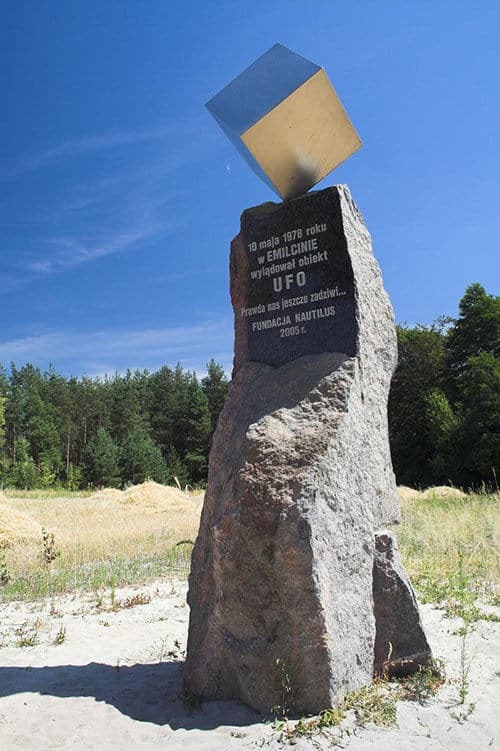 In the years since, a small monument was erected in the location of the encounter, and the event even made the pages of a Polish comic book. So, at least locally, people believe a sane man when he sees strange things.